Solihull SC British Water Polo Champions! 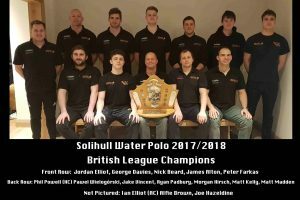 Solihull became British Water Polo League men’s champions last weekend when they defeated Manchester 7-6 in the final round of Super Five matches. Solihull entered Division 5 of the BWPL in 2012 with a young team and gained successive promotions through the divisions finishing 3rd in their first year in Division 1 last year. This year they have stepped up further and clinched the title. They still have a relatively young squad with 7 of the 13 players used this season being 21 or under. All of the players live in the West Midlands and play locally in the Midland Water Polo League mostly for Solihull with the addition of 3 from Boldmere and 1 from Coventry. Coventry women’s team were also competing in their BWPL Super Fives finishing 4th. Mrs Susanna Carden is one of the only two people in the UK this year to have been selected for the British Swimming Referees Development Programme. This is for those who potentially will be asked to referee at the highest levels including the Games and Commonwealth Games. Watch for her on TV! Brian Rainsford of Kingsbury Aquarius has been selected as Volunteer of the Year 2018 for his services to swimming over more than thirty years. Up from one place last year Warwickshire Masters maintain their record of finishing in the top four for twelve years. The full results are subject to ratification, but second place is secure. The event gets harder each year, evidence of this is that less than 100 points in 1,600 separating the top four teams. 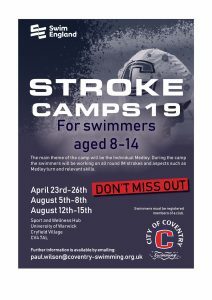 Many thanks to Trevor Clark – Team Manager for his sterling work in persuading the best Masters swimmers in the county to compete. Two of the team, Dan Moore in the 18-24 and Jackie Grace in the 55-59 years age groups both broke the Midlands record in their individual races then swam faster leading off relays than they did in their earlier individuals – unfortunately lead off legs in masters can’t be used for record purposes, but the individual times stand. 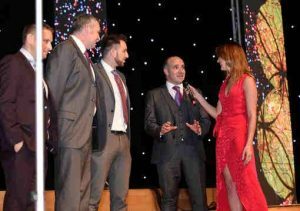 were presented with the Birmingham Mail ‘Fundraiser of the Year’ award. In addition their relay swim has been sent to the Guinness Book of Records for ratification – 19 hours 24 minutes. Unfortunately two of the team were not available on the night. It is with very deep regret that the death of John Russell and Peter Washbourne, both past presidents of the Association has to be reported. John was Past President of the association (1992) and in recognition of his sterling work in the swimming world also Past President of the ASA. He served in many roles with particular emphasis on Life saving. He served on the executive of the county association for over thirty years and provided valuable council. He was a highly respected Referee and assisted in the training of many of the swimming officials active today. As an ASA ‘friend’ he supported many clubs that were having difficulties and helped them resolve their problems. His wife Pat – also a Past President of the association pre-deceased him by some years. His health had declined somewhat and he had not been active on the executive for some time, but still maintained a keen interest and was always available when his advice was sought. The association extends condolences to his sons and their families. Peter was also a Past President (2002) and served on the executive for nearly thirty years as the Rules and Handbook Secretary for much of that time, making his last contribution to the 2017 handbook, in his usual meticulous manner, only a day or so before his death. The succeeding Rules and Handbook secretary will have a hard act to follow. Peter was always available and served in his own quiet unique way. He will be sorely missed for his wise council, attention to detail and friendship. The theme of the tributes sent in is that he was a gentleman. The association extends their condolences to his wife Leila.